This book was first published in England in 1963 by the firm of George Allen & Unwin Ltd. This company specialises in publishing books on Yoga and metaphysical subjects, and through its branches situated throughout the world the present volume reached spiritual seekers in many countries. 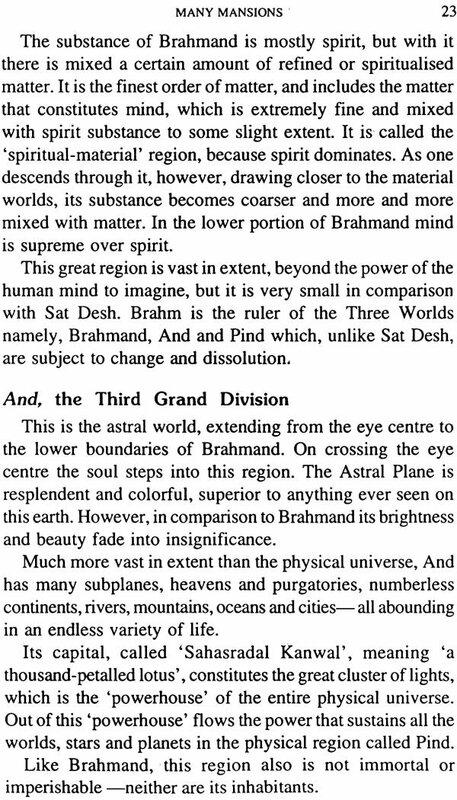 The response received from these readers shows that Yoga and the Bible serves a useful purpose in pointing out the fact that the spiritual teachings of Jesus and the founders of the other major world religions are the same as those that have been given out through the centuries by the many truly great Masters of India, Persia and other eastern countries. Many western readers have reported that the book has been of particular value in "bridging the gap" between the teachings of the Christian religion and the teachings which today are imparted by the Master of what has always been the highest form of Yoga taught in the East. This is Shabd Yoga, the Yoga of the Divine Word or Logos of the Bible, which is the creative and sustaining power and life-force of the Supreme Father. It is because the present work has apparently been able to explain many basic religious and spiritual truths to those interested in discovering the real meaning of the highest system of Yoga, that it is now, with the consent of the author, being reprinted in India. It is hoped that it will continue to be of help to those who are looking for the highest form of yoga, and that it will continue to aid readers in discovering the similarity of this age-old Yoga with the teachings of Jesus as given in the New Testament. I consider it my great good fortune to have been granted an opportunity to give my humble contribution to the Foreword of this book for which I am greatly beholden to my revered Master. For many years it has been my privilege, together with many others both in India and abroad, to be a disciple of a perfect spiritual Master of the Radha Soami faith or spiritual science. During these years, I have watched men and women of all classes sit humbly in an attitude of sublimation and reverence at the feet of the Masters listening with rapt attention to their discourses concerning the subject matter of this book. This Radha Soami faith or spiritual science is above all castes, creeds, colour, race, and climes, leading men to immortality and eternal bliss. 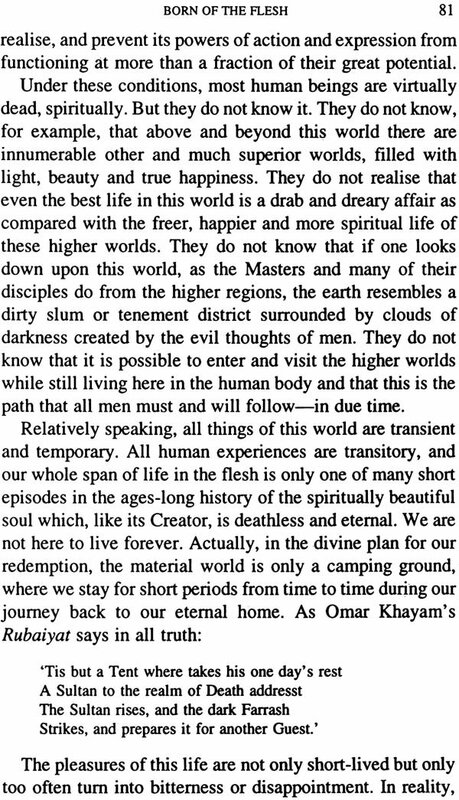 In the east, the essence of these teachings is widely known and accepted as the veritable expression of spiritual truth, the true explanation of the purpose of our life on earth, and of our ultimate spiritual destiny. Some of the facts presented here may be new to western readers. But they are well comprehended by great numbers in the east. Rightly considered, they should expand the reader's knowledge towards a more comprehensive understanding of the order of the universe and the divine plan for mankind's spiritual salvation. The contents of this book are based on discourses and writings of Masters of this spiritual path who are very well known in India. There is no expression of personal opinion on the part of the writer. The living Master of the present day referred to in this book - Maharaj Charan Singh Ji of Beas, Punjab - is venerated and honoured throughout India and in other eastern countries, as well as by those who are his followers in Europe, Africa and America. His genuine Mastership is acknowledged and attested to by tens of thousands in all parts of this country who have been accepted by him as disciples. He is revered and loved in India for his noble and benign human qualities, and inexpressibly more for his unquestioned spiritual powers. In him we see a sage who can awaken in man the spark of divine light and give the right conditions for the flame to blaze forth until all the lower propensities and desires are sublimated. 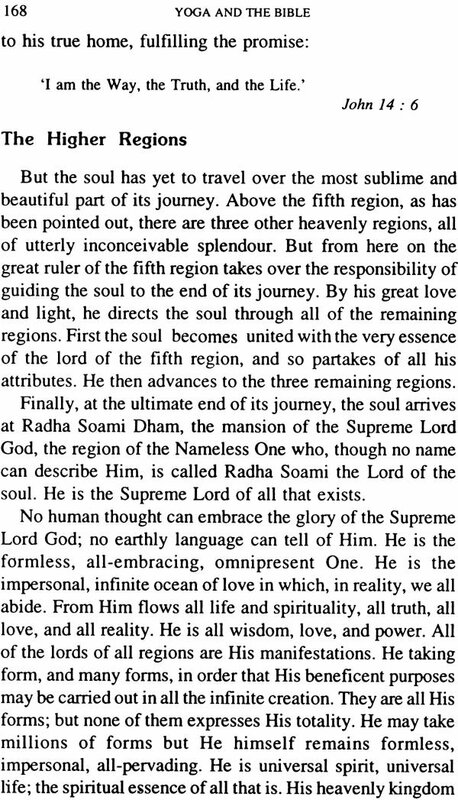 He is serene and calm, illuminating the way for bewildered humanity to attain union with the divinity. The Master represents the essential and unchanging truth of the ancient spiritual wisdom of India. In this age of doubt, scepticism, strife, hurry, religious controversy, ritual and ceremony, he comes with his message direct from the realms of the spirit, calling men and women away from the din and strife of tongues into the peaceful path of stillness within their own souls. 'The light that lighteth every man that cometh into the world' ever burns steadily and surely for all who will turn their weary eyes from the strife without to the quiet within. 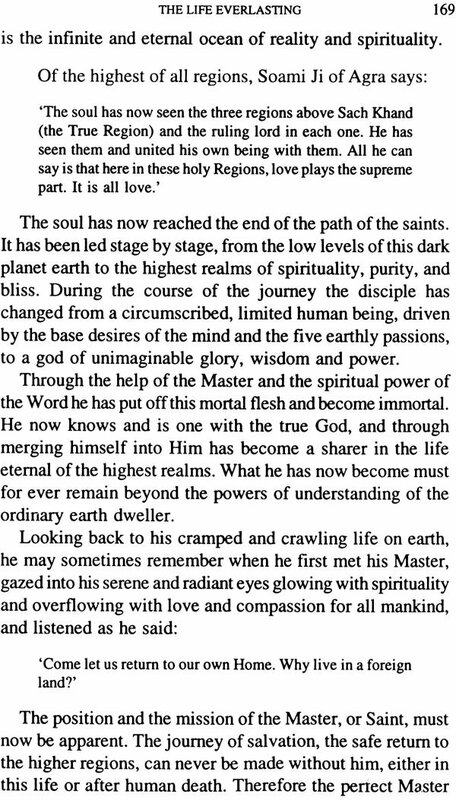 His teachings bear evidence of his communion with God and of his supreme ability to reveal spiritual truths. They possess a compelling power to answer the questions of the seeker, to put an end to doubts, and to bring peace of mind and soul. Thus, he is like a shade-giving tree in a thirsty land, or a sheltering rock in a storm. 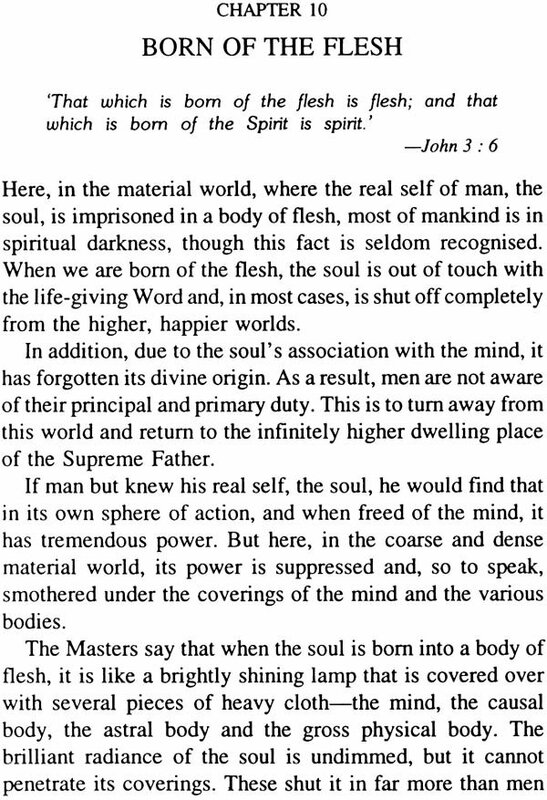 The Master teaches that the soul of man is divine, and one in essence with the Supreme Creator. This divinity may be temporarily obscured, but can never be lost. It is the Master's function to teach man how to realise his own innate divinity, and to show him the way to God-realisation and to what is called in the western world 'Salvation' or 'Liberation'. This the Master does with unerring love and certitude, as can be testified to by many thousands in this country. Our revered Master is verily the ocean of life; beneath the turbulent waves, beyond the reach of tempests, he abides in the eternal calm. Mr Joseph Leeming was initiated into the Radha Soami faith in the year 1954, and since then he has made six visits to the Radha Soami Colony at Beas to study and assimilate the teachings at first hand. During one of these visits we had the privilege of welcoming him, together with our revered Master, at Sangli, where. 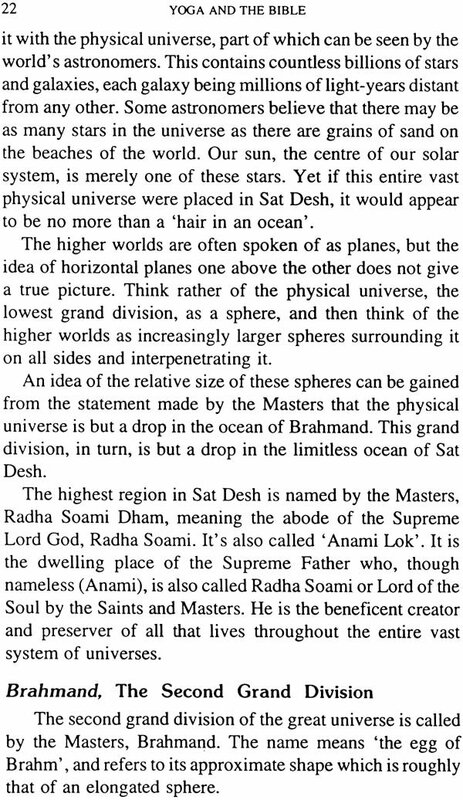 we had many discussions on the various aspects of the spiritual science of the Masters - the yoga of the divine Word. Mr Leeming impressed me as a very sincere and thorough student with a keen and trained intellect and an extensive knowledge of eastern philosophies and religions. These qualities enabled him to understand the teachings very accurately and comprehensively, and to assess their value as compared to other systems of spiritual knowledge known and taught in the east. I can say that he has carefully analysed every aspect of this teaching. He has not accepted it blindly, but has systematically considered and weighed every point. I am happy to write the foreword to this book, knowing that every word contained in it is factual, accurate, and true to my knowledge. It is hoped that it may aid in introducing the living Master and the spiritual science which he and all other perfect Masters have taught, to those in the English speaking world who are searching for the light of spiritual wisdom, understanding, and achievement. This book is written primarily for the peoples of the west who, unlike many in the east, may be unfamiliar with its subject matter. Its purpose is to present in simple language some of the basic principles of the Yoga or spiritual science of the Masters, which has been taught for many centuries by the truly spiritual Masters of the east. Though little realised in the west, this Yoga is closely similar in essence to the basic spiritual teachings given in the Christian Bible. In recent years 'Yoga' has become a familiar term in the western world. Most westerners, however, know of or practice the postures of Hatha Yoga, which is the lowest form of yogic spiritual discipline. Hatha yoga is very beneficial in promoting bodily health and mental serenity, but plays only a minor role in developing the higher spiritual consciousness. 1. Bhakti Yoga, the yoga of devotion. It discards all rites and ceremonies and seeks union with the Lord through the force of love only. 2. Karma Yoga, the yoga of action. It enjoins upon its followers the necessity of doing one's duty, whatever that may be; but without fear of blame or expectation of rewards. The essence of Karma yoga is the ideal of duty well done and the spirit of unattachment. It rejects the idea of renunciation and insists that one play one's part to the fullest extent without looking to the fruit of actions. 3. Jnana Yoga. This yoga seeks to concentrate and still the mind by easy and natural methods of mental discipline and control. The emphasis is upon the mind, rather than the body . 4. Ashtang or eightfold Yoga, also called Raja Yoga, the system described by the ancient Indian sage, Patanjali. This is a comprehensive system of yoga training, which embraces both physical postures and mental disciplines. Many of its devotees rise to relatively high states of spiritual consciousness. The yoga of the divine Word, or Shabd (divine sound) Yoga, described in these pages, is the highest of the Indian yoga systems. Its aim is entirely spiritual and its purpose is to enable the devotee to achieve salvation or liberation while living here on earth. Its system of meditation and other spiritual practices takes its followers to the highest attainable states of spiritual consciousness. Nothing contained in this book is the mere opinion or idea of the writer. He makes no claim for himself and takes no credit whatever. Every fact presented and every statement made is taken from the teachings of the Masters, who speak not of what they believe, but of what they themselves experience and see and therefore know at first hand. And every fact and every statement has been demonstrated to be true over and over again, times without number, by the Masters and their disciples both in the past and in this present, practical twentieth century. This book, in short, is not a compilation of theories or speculations. It is a statement of facts. If there are those who may not be able to believe them, these facts do not therefore lose one iota of their truth. Some of the statements contained in the book may appear dogmatic, or even unbelievable, to those who meet them here for the first time. That is, in all probability, unavoidable. 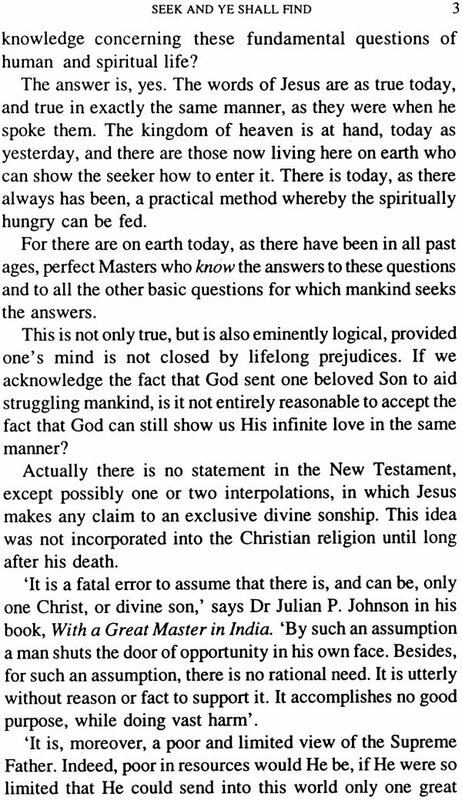 But in studying the teaching of the Masters, it is urged that for the time being at least the reader should try to divest himself of all prejudice and adopt an attitude of open-minded enquiry. He should not shut the door in his own face by assuming in advance that there is nothing new to be learned. For most of us there are yet 'many things in heaven and earth' not dreamed of in our philosophy. Man in his search for truth has misinterpreted much and has often been unwilling to accept anything save that which comes to him surrounded by an aura of ancient tradition. For the most part, people on this small earth are materialistically minded. They have been so taught by precept and example. 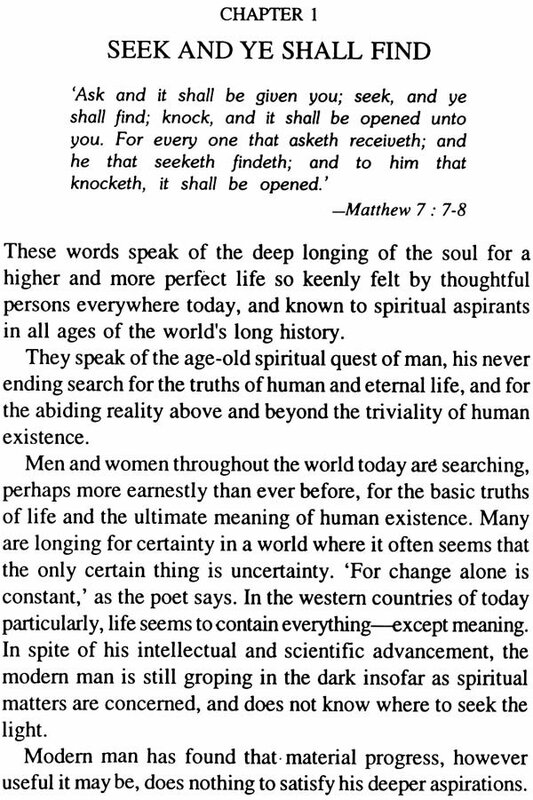 The concepts of the higher life that are available to them have been so vague that often the teachings have been rejected when, at the same time, there has been a deep desire for knowledge of how life should be lived to fulfil man's destiny and the Creator's purpose. This is the necessary attitude, and it is welcomed by the Masters. They ask anyone who is sincerely interested to come into the laboratory of individual experiment and experience, and there prove for themselves the truth of these teachings. There is never any question of proselytising in connection with the work of the Masters. Such an activity is of no use and is not permitted in this field of enquiry. 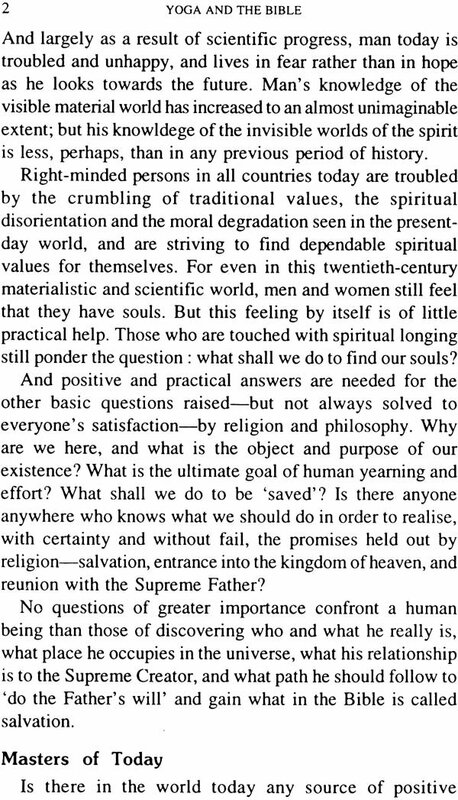 But those who are not satisfied with abstractions and speculations, who have been searching for specific and practical guidance in spiritual matters, and who feel that there must be something more to be learned than is obtainable from present-day religions or philosophies, may find what they seek in the Spiritual Science described in this book. In an effort to make the spiritual principles presented here more readily understandable to those who are unacquainted with them, the familiar sayings of Jesus are used throughout the book. These are known to all western readers, and at the same time they express the same fundamental truths that have been taught by all truly spiritual Masters of all ages. The meaning of these truths is then discussed as they have been explained by past and present Masters of the east. It will be found that their teachings and those of Jesus are essentially similar. 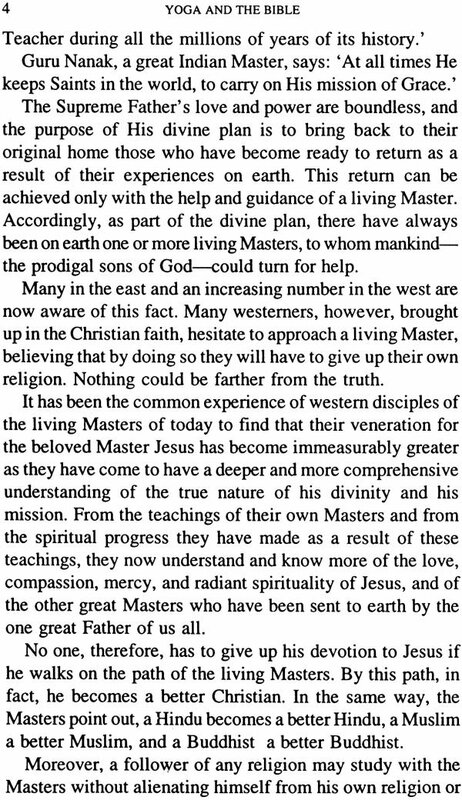 Many of the sayings of the eastern Masters are included as of interest to the reader and because many western students have found it helpful to see the truths given by Jesus stated in the terms used by other great Masters. Included among these are a number of statements quoted from the Adi Granth, which is the scripture of the Sikh religion. Though little known in the west, it is one of the world's most remarkable holy books, containing numerous illuminating discussions of true spirituality and the methods by which it is attained. The Adi Granth was compiled by the sixteenth- century Master, Guru Arjun Dev and some of his successors. 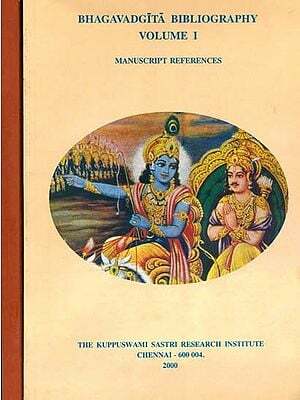 Other quotations are taken from the Bhagavad Gita, which is as honoured among Hindus as a true guide to spiritual living and advancement as is the New Testament among Christians. The writer wishes to acknowledge his debt to other books written in English about the teaching of the Masters, without which the present work could not have been prepared. He is particularly indebted to Dr Julian P. Johnson, who, under the inspiration of Huzur Maharaj Sawan Singh Ji, One of the greatest of recent Masters, wrote With a Great Master in India, and The Path of the Masters. Other works that have been of special value include Spiritual Gems, a collection of letters by the Master Sawan Singh; Light on Sant Mat by the Master Charan Singh; the Sar Bachan, or 'Essence of the Teachings', by the nineteenth- century Master, Huzur Soami Ji Maharaj of Agra, who in this book is called simply Soami Ji the title by which he is known today in India; and Mysticism, the Spiritual Path, by Lekh Raj Puri.